In this week’s episode of Games to Gains, James Grage starts off by complimenting Kerby on all the progress he’s made. 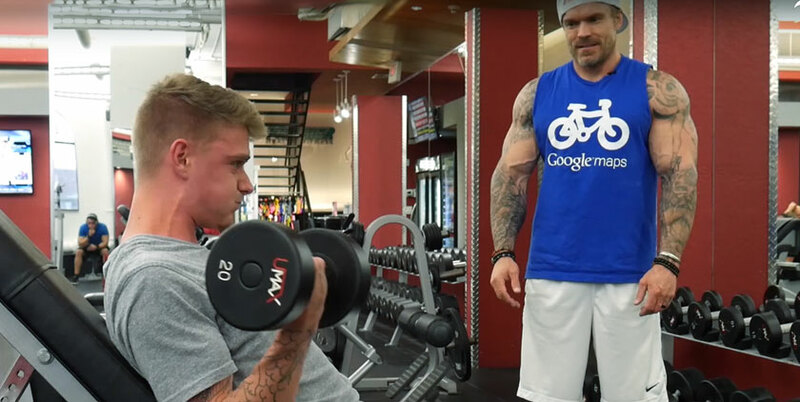 By sticking to his nutrition plan, the training program and the supplement schedule that James provided, Kerby has not only put on muscle, he’s improved dramatically in the gym. James: It used to be that anytime I would ask you to lean forward, that’s where you got all crazy. The neck and the head would start doing weird things. Now you just look really solid and in control. Kerby: Ya, it feels good when you ask me to do something to actually be able to do it. Then, the conversation takes more of a personal turn. James: You’ll never guess who I talked to this week. Kerby: Can you give me another hint? Kerby: A woman… hmmm. I don’t know! Kerby: My mom?! Dang! How did that go? Charlotte (Kerby’s mom): James, Kerby doesn’t know I’m calling you. He would be mad. But hey, I just wanted to personally thank you for taking initiative in Kerby and just doing the things you’re doing. I mean, you see what we see, and not too many other people see it, so I just wanted to thank you. He lost his sister at 22 in a car accident, and Jim (Kerby’s dad), as you probably know, in the last year and a half he survived stage three throat cancer. So Kerby had a few pretty big hits. After that conversation, James made a point to tell Kerby how proud his parents were of everything he’s accomplished and everything that he’s doing right now. Not just anyone could pick up and move across the country. Why? Because of fear. So many people are afraid to fail, but when you really think about it, failure is nothing to be afraid of. You just have to realize that you’re going to fail a lot in life, but that’s what makes you stronger and better and smarter. Watch the full video above to hear James delve more into this topic.